Wagner's opera Parsifal features prominently in the 1934 drawing, it was originally based on Wolfram Von Eschenbach's thirteenth century Grail romance, Parsival. Picasso knew Wagner's version of the story and identified himself with Parsifal. In the 1934 drawing, at the age of 52, he reveals, albeit secretly, the extent of this symbolic identification. It has been well reported that the letters of Picasso's name had magical significance for him. The first four, Pica, means spear in Spanish; which would certainly be one reason why Picasso might identify with Parsifal in Wagner's opera. Picasso would have realised a further significant link in the final stages of the opera. In the second act, Parsifal begins to suffer the pain of Christ's wound in the process of a mystical identification with Christ. By 1934, Picasso had long identified himself with Christ and the Crucifixion in his art and the wound was already one of his personal symbols for suffering and yearning for its resolve. The Spear that had once wounded the side of Christ is pivotal in Wagner's story. Klingsor, a powerful black magician steals it and with it wounds Amfortas, the King of the Guardians of The Holy Grail. He then flees with the Spear to his castle where he dominates the surrounding area using powerful black magic. All this while, Amfortas is destined to lay in agony from the wound which never heals; his only hope of recovery being the Spear's return. Halt, I have the right weapon to to fell you ! The fool shall fall to me through his master's Spear. Klingsor and his Castle then sink into the sea as if hit by an earthquake, and the gardens that once surrounded the castle turn into a wasteland. Parsifal restores the Spear and heals Amfortas of his wound. He then becomes anointed as the new King of the Guardians of The Holy Grail. In the 1934 drawing this pivotal scene is portrayed by the spear hovering above Picasso's head. The spear runs along the top edge of the drawing and when the image is rotated 90 degrees to the left it forms the shaft of a huge letter 'P" in conjunction with the black semi-circle in the upper right corner. The 'P' denotes a cryptic Picasso signature and refers to the artist's identifications with 'Pica' and Parsifal. The central figure is identifiable with Parsifal reaching up and making the Sign of the Cross. His 'flying hand' concealed within the island of light in the right hand figure's face can be seen to be blocking Klingsor's advance, it is located immediately to the left of Klingsor's face which in turn seems to descend from the rear end of the spear in the upper right corner. The figure on the right would seem to characterise Kundry, the witch who was present at Christ's Crucifixion and who under Klingsor's spell attempts to seduce Parsifal. In the drawing she appears possessed by Lucifer or the Devil, both of whom are appropriate characterisations of Klingsor. Behind the hidden face there is a trident form, which seems to reinforce the hidden face's connection with Lucifer. According to Dr Walter Stein and others, Hitler was convinced that in the ninth century he had been incarnated as the historical Klingsor, sometimes known as Landulf II of Capua ! Stein had been a acquaintance of Hitler in the years preceding World War One and claimed that Hitler had at that time undertaken a penetrating study of Von Eschenbach's story and fathomed it's deepest occult meanings. 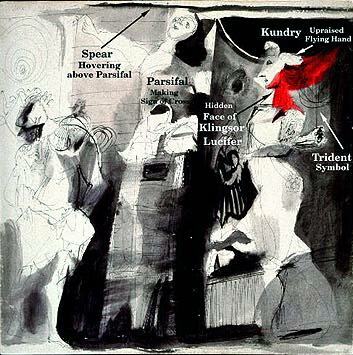 The self identification of Picasso with Parsifal and the self-identification of Hitler with Klingsor appears by some uncanny means to have found its way into the 1934 drawing which might indicate that Picasso had access to secretive information about Hitler and his occult activities at least five years before the Second World War.